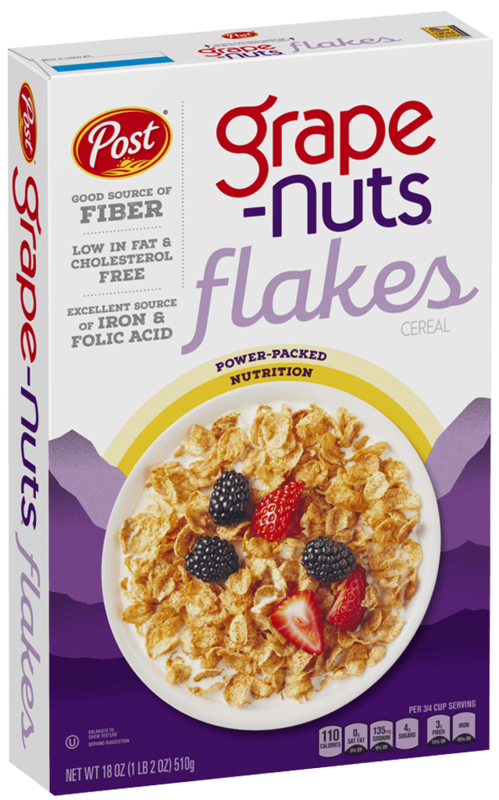 Post Grape-Nuts® Flakes pack delicious whole grain goodness into lightly crispy flakes. Whole Grain Wheat, Wheat Flour, Sugar, Malted Barley Flour, Canola Oil, Salt. Reduced Iron, Zinc Oxide, Niacinamide (Vitamin B3), Pyridoxine Hydrochloride (Vitamin B6), Riboflavin (Vitamin B2), Vitamin A Palmitate, Thiamin Mononitrate (Vitamin B1), Folic Acid, Vitamin B12, Vitamin D3. * Nutritionists recommend eating 3 or more servings of whole grain foods per day (about 16g whole grains per serving or at least 48g per day) † Diets rich in whole grain foods and other plant foods, and low in saturated fat and cholesterol, may help reduce the risk of heart disease.